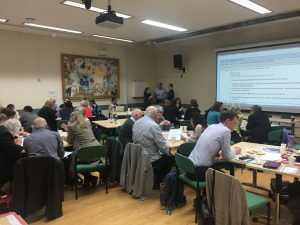 On 9th May, 2017, the UKCRC TDCC co-hosted the workshop ‘Patient data and tissue samples – benefits, barriers and concerns’ along with Use MY Data<, Independent Cancer Patient’s Voice (ICPV) and the NCRI’s Cellular & Molecular Pathology (CM-Path) initiative. 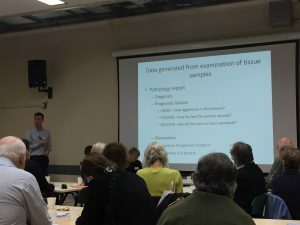 The event was a good opportunity to delve into the issues associated with tissue sample and data donation for research. • Hilary Stobart, a patient advocate of ICPV and use MY data, kicked off the session by stating ‘Tissue donation always starts with me’ and walking us through her journey from a donor to a human sample resource volunteer. • Dr Alastair Ironside (right), a pathologist from Barts Cancer Institute and PPI lead for CM-Path, gave a fascinating insight into the life of a pathologist, including how they sit right at the interface between the clinic and the lab. • Dr Amir Gander, of Tissue Access for Patient Benefit summarised the highs and lows of his work in managing tissue access for research. • Dr James Flanagan, Senior Lecturer, Imperial College London, explained his research on epigenetics including the importance of experimenting on human tissue. The panel were then grilled by the audience who had plenty of questions on the pathway. 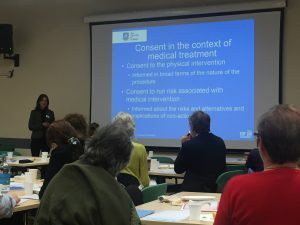 Victoria Chico (left), lecturer of law, University of Sheffield opened the second session with a talk on ‘Using and disclosing confidential patient information and the English common law: what are the information requirements of a valid consent?’. This outlined different legal basis for consent and the advantages and disadvantages of them. Amanda Hunn, Joint Head of Policy, Health Research Authority, presented their plans to open public dialogue on consent for tissue and linked patient data. A series of further workshops will be hosted later in the year in order to gauge public opinion on the matter. Finally, Amanda Gibbon, member of Human Tissue Authority (HTA), explained the history and remit of the HTA with her talk on consent and the HTA. It was time for debating in the final session where tables were assigned topics and told to put a case together for and against their topic. The issue of whether tax and financial data should be used for medical research was one of the most inflammatory topics and the teams remained divided about its relevance. A big thank you to all the presenters and attendees for making the day a success. The event received overwhelmingly positive feedback and we will be feeding back to attendees in the near future. All the slides from the day are available here. For more information on any of the issues discussed please get in touch with us. This entry was posted in Events, Public Engagement and tagged data, event, Patient, samples, workshop. Bookmark the permalink.